What a good month for Indian English: two of its most acrobatic exponents bring out long-awaited sequels to their best-selling novels within days of each other. Much ink has been and will be spilled on Amitav Ghosh’s Ibis trilogy, and its ambitious and imaginative reconstruction of an English for 19th-century, pre-imperial India. So let us turn to Anuja Chauhan, whose new book confirms her reputation as one of our funniest and most entertaining novelists, and should justly be praised for the wit and sophistication of her 21st-century, decidedly post-imperial English. Writers of popular fiction, sometimes sneered at for the poverty of their language, are apt to dismiss their critics as nit-picking snobs. Both parties could do with a reality check. Whatever flatness or dullness can be ascribed to Indian English fiction, it is almost never because its writers attempt to capture the rhythms and sounds of everyday English in India; some of the best Indian novels in English succeed because they do exactly that. Any doubts on this score should be amply cleared by the career of Chauhan, who does both commercial fiction and, to give it its academic name, “chutneyfication". The markers of her books are now familiar to her readers: the clever, quirky families, the screwball-comedy romantic leads, backdrops made of some of the most absurd things Indians are crazy about, such as cricket, elections, and—as far as I can make out from the success of Those Pricey Thakur Girls, the precursor to The House That BJ Built—the 1980s. As far as these things go, Chauhan is such a safe pair of hands that I can’t help but feel that the real excitement of her books comes from the snapping, crackling, mile-a-minute, code-switching language of her books, stuffed with jokes and half-jokes at every turn. How can you not look forward to what characters who deploy words like “incomepoop" (people who work for a salary, instead of being smart and entrepreneurial—another Indian obsession) are going to say next? Banaoing is the subject of The House That BJ Built—the beautiful family homestead on 16 Hailey Road in central Delhi, which has become the subject of a property dispute. Those Pricey Thakur Girls drew comparisons to Jane Austen because its titular characters were five beautiful daughters, some in want of husbands. 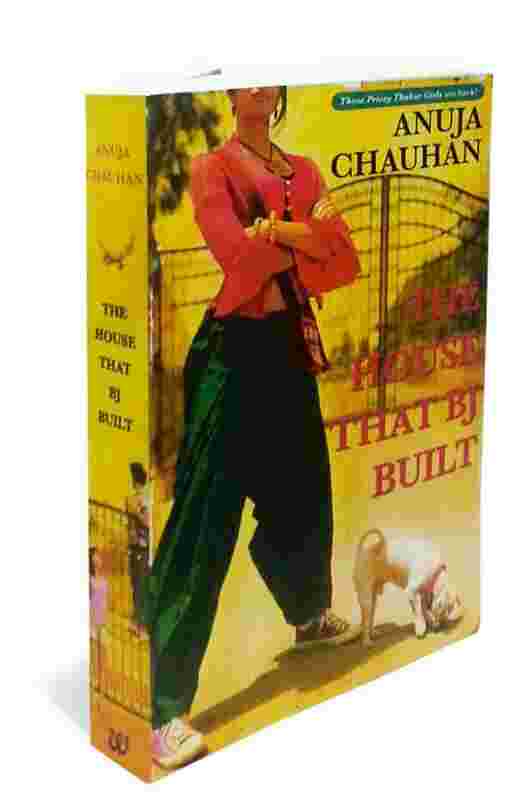 But if the spirit of Austen resides anywhere in Chauhan’s work, it is in this book, full of Austen’s abiding themes—family bitterness, female dispossession, and real estate. Debjani and Eshwari, the Jane and Lizzie Bennet of the previous book, have become carping, anxious women as they approach middle age; at least one of their elder sisters has become an utter pill, while the other has remained as vain as she was 20 years and a novel ago. The thorn in their side is their dead sister, Binni, whose sole surviving heir, Bonita, is running a thriving business in fashion knock-offs from her rooms on 16 Hailey Road. Bonu, a money-minded sort, is a practical soul, but also a haunted one, with reasons to hold on to the old house that are as compelling as her aunts’ desire to sell it. When Eshwari’s old swain, Satish Sridhar, comes with an offer to buy them out, a long drawn-out battle ensues. Complicating matters are the machinations of a wily uncle who has an eye on the property; and Samar Vir Singh, Bauji’s (BJ) beloved step-grandson, who must mediate the sale, and try not to fall in love with Bonu. It is Chauhan’s darkest book yet: the halo has worn off the previous book’s darlings, and Bonu is hard to categorize as a standard Delhi sweetheart—perhaps a closer comparison than any of Chauhan’s previous heroines is the grande dame of Battle For Bittora, the venerable and venal Pushpa Pande. Samar is more a cipher than Chauhan’s other heroes, but this book’s cast is so large, and so entertaining, that he basks in their reflected glory, as they wonder about whether he is shaadi-shuda (married) back in Mumbai, or serious about his “living" girlfriend. Chauhan’s portrayal of the foibles of the Indian upper classes can sometimes go overboard (a character, upon hearing of Irom Sharmila, says, “I didn’t know Sharmila Tagore was a North-East"). But mostly it hits its mark. Chauhan is no satirist, and her ear for the ways in which we speak, and the petty prejudices and casual nastiness that creep into our bubbling, tripping everyday English is used to make us laugh, rather than to wound us. As Eshwari might say, you’d get upset—very upset—but not ho-ji upset. A minor character in an earlier Chauhan novel is compared to “extra-sweet Dussehri mango" that’s been cut with the onion knife. In romantic comedies, of course, no amount of onion can engulf the extra-sweet aftertaste. It would be absurd to feel a pang of disappointment about this, as the book’s myriad subplots tie themselves up, and Samar and Bonu beat their odds. As with the best fiction of any kind, there’s more truth here than advertising: The House That BJ Built gives its readers, and its characters, exactly what they paid for. Supriya Nair is an editor at The Caravan.